Women spend their working hours as slaves to fashion: squeezed into trendy dresses and skirts, adorned by sparkled baubles, and perched on teetering heels. Dearform Sleepwear offers us a respite from these burdens: super soft fabrics, comfortable cuts, and quality construction. 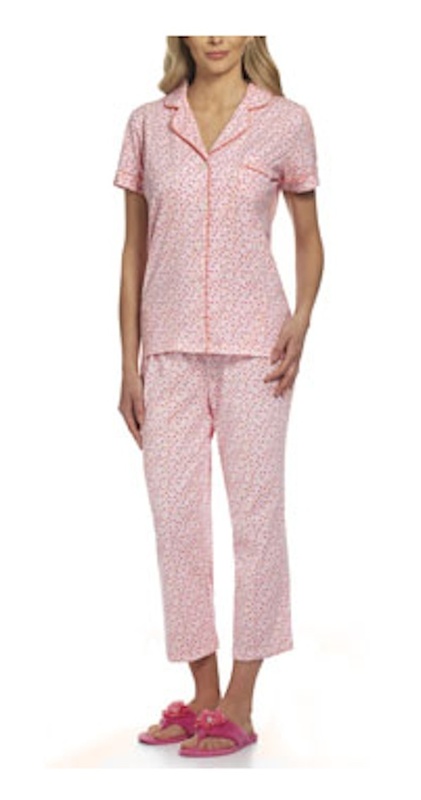 Slipping on a pair of women’s pjs after a long day ensures an evening of relaxation and indulgence. As efficient multitaskers, women focus on others’ needs: keeping the family calendar, cooking, cleaning, laundering clothes, running errands, and chauffeuring children from activity to activity, in addition to the daunting task of managing our own work and social schedules. At the end of a long day, Dearform allows us to focus on ourselves. With more than 65 years of experience in comfort, Dearform Sleepwear applies the same attention to detail and luxury to their newest collection of women’s pj sets and robes as its slippers. Whether one chooses to lounge in the Notch Collar Capri PJ set or head straight for the sheets in the Cap Sleeve Sleep Tee, the super soft stretchy jersey fabric will cradle one’s curves; the playful patterns will reflect one’s femininity, and the stitched edges and tagless pieces help one focus on sleep and rejuvenation. The durable construction and easy-to-maintain fabrics make Dearform Sleepwear a respite of simplicity and effortlessness: machine wash in cold water and tumble dry on low heat, so your bit of relaxation does not create more work! Don a pair of Dearform Slippers to complete the look, and let the relaxation begin! I tend to just wear tshirts and yoga pants to bed, but the Dearfoam slippers are a must for me! I have a pair of them on my feet right now! I would love to have real Pjs….I wear old shorts and tank tops. They sound super comfortable and you can never go wrong with soft cuddly pajamas. I love PJ’s I wish I could go to work in them LOL. I never knew Dearfoam even made PJs. I need to get a pair as they look perfect for the upcoming warmer weather! I love a good set of pj’s! Thanks for sharing. I need some comfy pjs! I love a good pair of PJ’s! There are some really cute PJs out there, but I never could stand to wear them since I burn up easily in bed. That totally makes me want to crawl into a pair of comfy pj’s. I didn’t know that they made them. I’ve owned a few of their slippers over the year and they are totally comfy! I love my pjs!! Thinking I need to go get into a pair now! I live in my pj’s, and I probably spend more on pajamas than I do on my clothes. Cami or a nightgown for me. i love coming home and changing into my pj’s, then watching movies with hubby on the couch. so comfy! I’m one of those people who get all dressed up for work and practically run to the bedroom to change into my comfy clothes. Nothing makes me feel better than after a shower to climb into some comfy jammies. Dearform knows what they’re doing too! I bet they’re great.